Ahhh, here we are, fast approaching that wonderful holiday season, when inevitably most people end up a little rounder and not so merry when they step on the scale. Then starts the long, uphill battle known as “New Year’s Resolutions” where we vow to lose the extra weight and eat better and regain our health. Sound familiar? Why do we do this to ourselves, over and over again? How many times have YOU made that resolution, to lose weight and eat healthier? Isn’t there a better way? Yes, of course there is! It’s just that most people don’t even know where to start. Well, it’s time to get off the merry-go-round and get serious about your health and the way you look BEFORE you pack on any extra weight over the holidays. I have developed a game plan to help you that take control of your eating. It takes you by the hand and teaches you what the right foods are to eat BEFORE you put on any extra pounds and inches. If you make the right choices (and avoid bad choices), you can truly start out January 1st as a HAPPY New Year. I am very proud of the course I have designed for you. It will take you step-by-step toward your goal of a healthier body and teach you how to keep it that way for the long term. And I guarantee it will work. 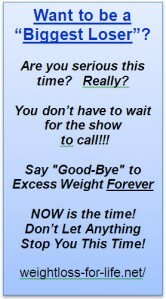 I call it WEIGHT LOSS FOR LIFE and it can work for you! Read all about it here. Here’s to a happy, and HEALTHY Holiday Season!